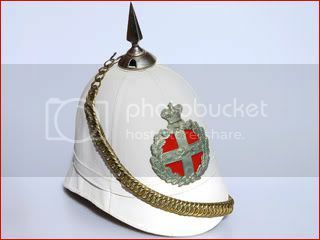 A white colonial pattern helmet to the New South Wales Infantry Company. This example features the "Badge of the Colony" and has the scarlet backing authorized in 1883. 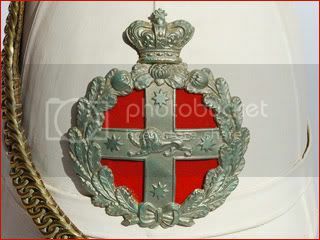 The principal elements of the badge are the Crown indicating a Royal regiment, the Cross of St George with the Lion of England and the stars of the Southern Cross, the whole being enclosed within a wreath of Waratahs, the floral emblem of NSW. This example is one of three known to exist, and comes from the collection of good friend Stuart Bates. 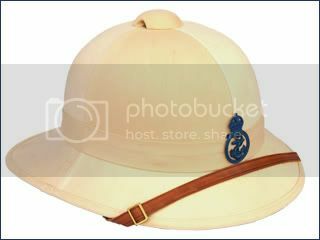 Used by the Australian Navy since World War II, this model is based on the British Wolseley sun helmet. 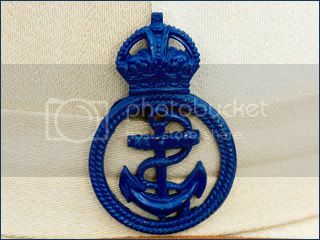 It features the NCO naval brass cap badge painted blue.